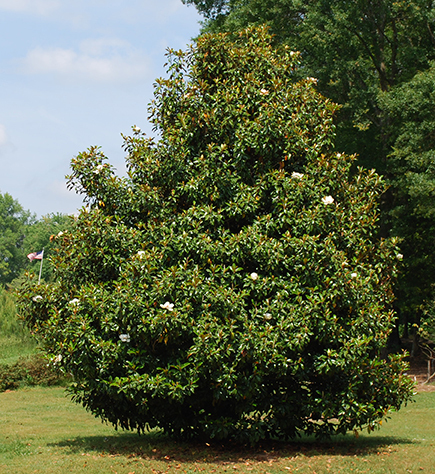 This native southern aristocrat has become a sensation over the past 30 years with the release of several cultivars that come in a variety of habits, sizes, and leaf shapes that make the species more suitable for smaller landscapes. Left to its own devices the moderately growing species becomes gargantuan (60-80 ft. high and 30-50 ft. wide). Select from the many available cultivars to acquire the right shape and density. The plastic-like leaves have a dark green waxy surface and green to fuzzy brown (indumentum) on the underside. The large 8 to 12 in. wide fragrant flowers appear in May. 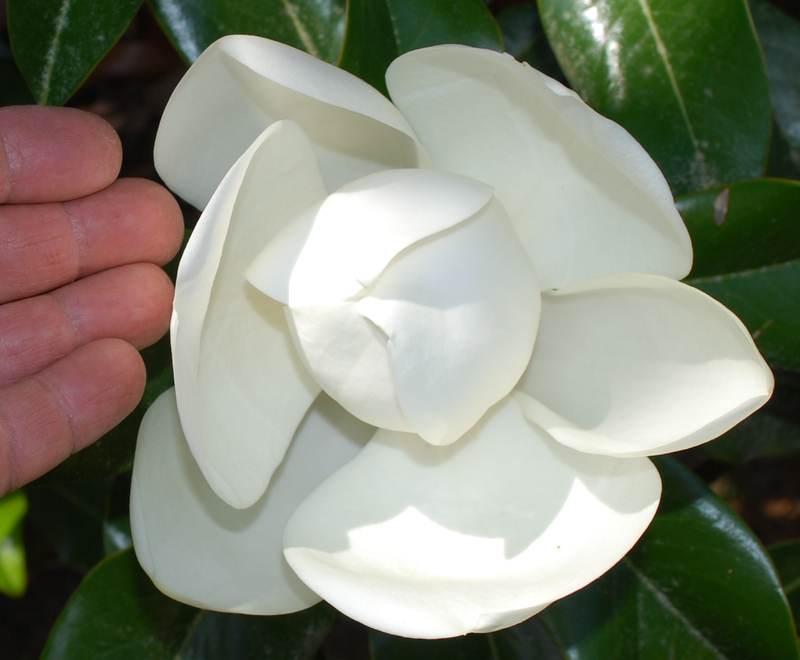 Flowers open sporadically in the crown and are often scattered; they do not open all at once like the deciduous magnolias. Many years are required to flower from seed (12 to 15), which is why you should select vegetatively propagated clones rather than sexually-derived ones. The fruit is composed of follicles that occur in 3- to 5-inch long “cones.” The individual red seeds emerge as the cone matures. Once established this heat- and drought-tolerant species is well-suited for planting in groups, hedges, large screens, in streetscapes, and parks. Several exceptional cultivars include ‘Bracken’s Brown Beauty’, ‘Claudia Wannamaker’, ‘D.D. Blanchard,’ ‘Hasse’, ‘Kay Parris’ (introduced by Kevin Parris in 1993, it is believed to be the result of a cross between M.g. ‘Little Gem’ and ‘M. g. ‘Bracken’s Brown Beauty’), ‘Little Gem’, ‘Mgtig’ (Greenback®), ‘Southern Charm’ (Teddy Bear®), and ‘TMGH’ (Alta®).